This unique elasticated scallop shell anklet makes the perfect gift to support your friends or loved-ones as they travel through life and face its challenges. The 1,000-year-old pilgrimage to the shrine of St. James in the Cathedral of Santiago de Compostela is known as the Way of St. James (El Camino de Santiago - in Spanish). Some 200,000 pilgrims travel to the city each year from all over the world to find inspiration and/or deeper spiritual understanding. Many carry with them a scallop shell like this - believed to promote strength and hope. Description: The anklet is elasticated, so is suitable for most sizes and can also be adjusted by the knot fastener. 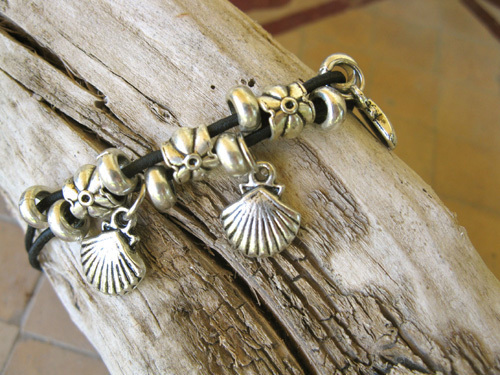 Three silver coloured symbolic scallop shells hang between pretty flower beads. Different colours available: Please choose in options box when ordering. The Way of St. James criss-crosses Western Europe, arriving at Santiago through Northern Spain. It is generally regarded as a journey of the body, mind and spirit. 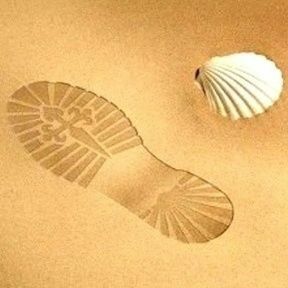 Modern pilgrims choose to do the Camino for personal, spiritual and/or religious reasons - or simply to take time out from their busy, modern lives. For many, the walk is to find inspiration - improving their outlook on life, bringing them into closer contact with nature and expanding their cultural horizons through contact with other pilgrims. Everyone experiences the journey in a different way. Do you know someone who could do with a bit more belief or protection as they embark on new ventures or set off on a trip / journey? Show them that you care and that you are thinking of them with this pretty camino anklet. Comes gift-wrapped, like all our presents - and we can print a personal message on your behalf.